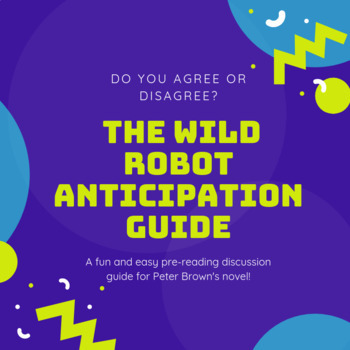 An anticipation guide is a great introduction to the themes, situations, and character conflicts throughout a novel, and Peter Brown's novel, The Wild Robot, has so many of them! I created the questions to embody the various situations, moments, and themes in the novel to engage students in deep, insightful discussions. This one-page document provides a set of 10 questions that pertain to topics students will encounter while reading. It is also editable if you'd like to add additional questions or topics. If you like this product, please rate, review, and check out my store for additional anticipation guides and other resources! Happy discussing!